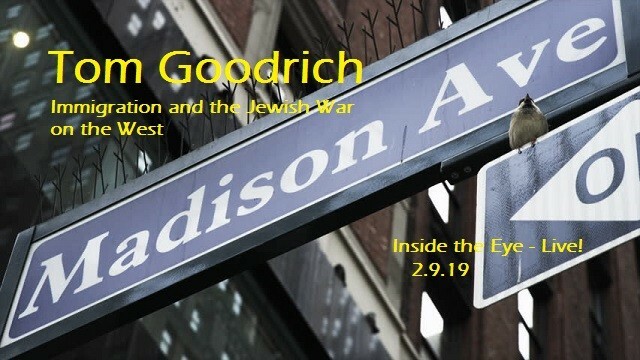 Tom Goodrich, Jews War on the West | Inside the Eye - Live! Michael “Tom” Goodrich, author of Hellstorm: The Death of Nazi Germany, 1944-1947, appeared in hour 2 of Inside the Eye – Live! As always, a plethora of subjects were broached plus a couple listeners calls during the segment. Caller “Frank”, a long time caller to Inside the Eye – Live!, recently managed to get onto the Alex Jones Show. Mike discussed the importance of reaching out at the local and national level and just raising our vision of “truth” as we see it. After all, the truth reverberates and if it spoken, people will hear it and it will reverberate even when people have no interest in hearing the truth. Trump’s SOTU and “the Wall”. Mike mentioned the idea of Trump “flooding the country” with “legal immigrants”. This resulted in a heated commentary and discussion around immigration, “legal immigration”, stemming the flow of illegal immigration, “merit based immigration”, and policies to reverse migration, and the obnoxious attitude of migrants who begin dictating to the people of the United States that Americans should adhere to these anti-Western values of immigrants. Ultimately, it is incumbent that we close the demographic displacement of European Americans and Europeans in general. Mike discussed the various ways in which Jews are at war with Western civilization. One was the overt way in which Jews work tirelessly to ensure that Western nations borders remain open and Europeans are thus forced to deal with a hostile foreign population that is ultimately invading Western lands. Another way in which Mike referenced the anti-White nature of Jews is in their advertising, which Mike called “Madison Avenue” and the nature in which Jewish advertising is so blatantly anti-White. Ultimately, what this all leads to is a precarious and dangerous future for Western civilization and for which Mike feels that there is still much hope and positive trends towards an enlightening future for what is a current darkening future for Western civilization. Ultimately, as Mike says, people are waking up and that we are winning as Jews lose their mask and reveal their hatred towards. This was a well received interview across the spectrum.